If you've done much mixing, the importance of having a 280 watt "exceptionally powerful" motor cannot be overstated. All of the convenience of having a hand blender is lost if it fails to perform the task. When it comes to performance, this model shines. Many customers remark on the suction effect created by its power. When you can feel the pull against the pan or bowl, you know those last stubborn chunks of food that refuse to yield to other mixers won't stand a chance this time. 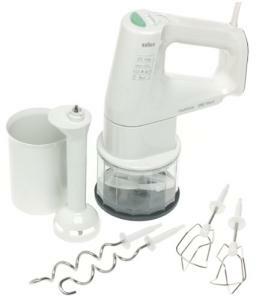 The M880 Multimix comes with four attachments: beaters, a dough hook, chopper, and blender. The beaters are designed in a way that reduces splashing, nearly eliminating those annoying mixing incidents- the ones you didn't notice while busily whipping ingredients, but discover as spots of cake mix on your wallpaper weeks after the cake has been and gone. An improvement over old fashioned designs, these beaters also give you better volume and lightness to your whipping. Mix, blend, puree, whip, chop, knead and more utilizing three speed options as well as a pulse control in this versatile kitchen tool. The mobile option with the power cord enables you to lock it in place or swivel it out of the way while you're working- never have a cord drag through your batter again. A safety button release system is included for attachments. An accompanying two cup container is especially handy for mixing and measuring liquid items for salad dressings or sauces. And the container for chopping items also has a snap-on lid for handy storage. The mixer stands upright on a base that prevents skidding. The switch appears to be the Achilles heel of this mixer if it is going to have one. With heavy use, this component tends to wear out more quickly than the rest, but even worn still provides some function. Also, some have found the switch and directional function counterintuitive. But overall, for the size, power, and mobility, the Braun combines the best of a traditional mixer with the streamlined function of a stick. For a more traditional hand & stand mixer set, see this model by Hamilton Beach. I’m looking for one too. This is a great little machine, but mine broke after 8 years.